Sint Eustatius, also known as Statia, or Saint Eustace, is one of the islands which make up the Caribbean Netherlands and formerly the Netherlands Antilles. It is in the northern, Leeward Islands portion of the West Indies, some distance southeast of the Virgin Islands. It forms part of the inner arc of the Leeward Island chain, lying immediately to the northwest of Saint Kitts and Nevis and to the southeast of Saba at 17°30′N 62°58′W. The regional capital is Oranjestad. It is named after the legendary Catholic Saint Eustace. Sint Eustatius is a special municipality (public body) of the Netherlands. 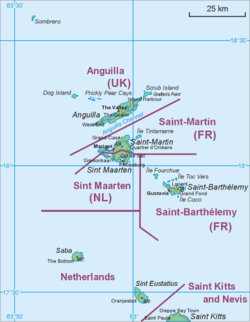 Sint Eustatius has a land area of 21 km² (8.1 sq. miles). At the 2001 Netherlands Antilles census, the population was 2,292 inhabitants, which means a population density of 109 inh. per km². In 2004, the population was estimated at 2,498 inhabitants. ↑ "Bevolkingsontwikkeling Caribisch Nederland; geboorte, sterfte, migratie" (in Dutch). Central Bureau of Statistics. 2012. Retrieved 2012-12-13. This page was last changed on 14 February 2018, at 17:33.